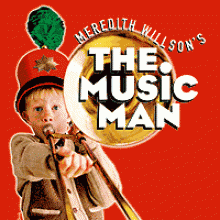 With great pride, the drama program announces that we will be performing Meredith Willson's, The Music Man this year. The show opens in the High School's Auditorium on Thursday, February 28th; Friday, March 1st; and Saturday, March 2nd, 2019. All shows are at 7:00 pm. ALL TICKET ORDERS WILL BE FILLED ON A FIRST COME, FIRST SERVED BASIS BEGINNING WITH FRONT AND CENTER SEATS. PLEASE SEE TICKET ORDER FORM FOR MORE INFORMATION. Below you will find several forms. If you are a business, for a small donation, an advertisement your business will be placed in the musical program and will be viewed by hundreds of people who attend the show. Click on the file below for more information. Well-Wisher Forms - If you would like to have a good luck wish printed in the program for your favorite performer(s) - complete at "Well-Wisher Form". Click on the file below for more information. Ticket Order Forms - There will be tickets available at the door for purchase - but to reserve a seat, order your tickets ahead of time. Below is the file to print, complete and send in with more information.